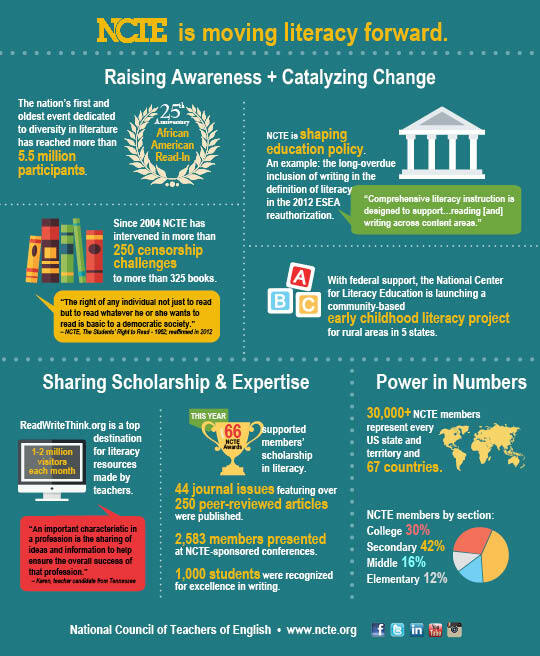 NCTE members moved literacy forward in 2014, how can you be part of the movement? Click on the images below to find 10 ways you can get involved in 2015. Plan a Read-in for February, 2015. Attend advocacy day March 5 in Washington, DC. Join the Literacy in Learning Exchange. Share resources from the Intellectual Freedom Center. Contribute to Read. Write. Think. Help your students apply for writing awards. Apply or nominate for an award. Read and write for one of our 10 peer-reviewed journals. Submit a proposal for the 2015 Annual Convention. Encourage your peers to join! This document was printed from http://www.ncte.org/actions2015.